Heat oven to 350°F. Place paper baking cup in each of 24 large muffin cups (2 3/4 inches in diameter and 1 1/4 inches deep). Make brownie mix as directed on box using oil, water and 2 of the eggs. Divide batter evenly among muffin cups (about 2 tablespoons per cup). Bake 15 minutes. Meanwhile, in small microwavable bowl, microwave chocolate chips on High 1 minute. Stir and microwave in 15-second increments, stirring after each, until chips are melted and smooth; set aside. In large bowl, beat cream cheese with electric mixer on medium speed until smooth. Beat in sugar, remaining 2 eggs and the yogurt until blended. Add melted chocolate; beat until well blended. Divide chocolate mixture evenly over warm brownie layer in cups (about 3 tablespoons per cup), filling each to top of cup. Cups will be full. Bake 22 to 26 minutes longer or until set. Cool in pans 20 to 30 minutes. Carefully remove dessert cups from pan (cream cheese mixture will be soft); place on serving platter. Refrigerate at least 1 hour before serving. 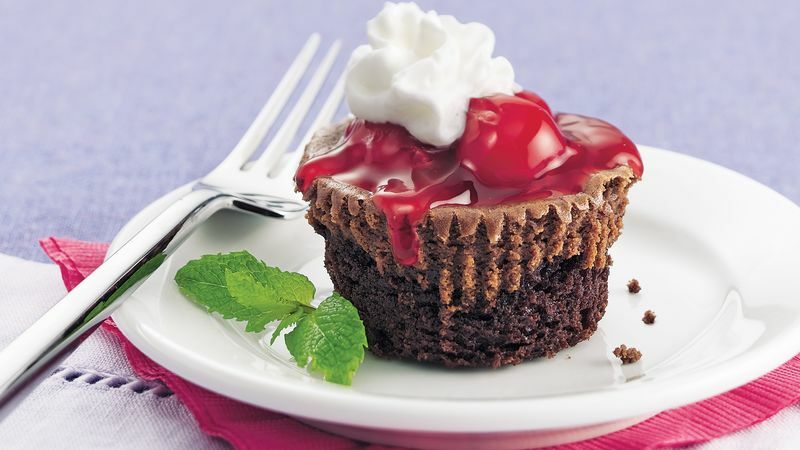 To serve, remove paper; top each dessert cup with 1 tablespoon pie filling (including 2 or 3 cherries) and 1 tablespoon whipped cream topping. If desired, arrange cupcakes on pedestal cake plate covered with linen napkin. Garnish platter or plate with mint sprig. Store in refrigerator.